What you want social media to do for your business, and what real people want and expect from businesses in social media are fundamentally different. This expectations disconnect and dissonance is the nucleus of all that is wrong and difficult about social media from a company perspective. In Q4 2014, Hubspot released new research called The Social Lifecycle. In this project, they interviewed 600 consumers about where and what and how they want to intersect with brands in social media, in both a marketing and customer service context. Several interesting findings in this research, and I was particularly intrigued because the new book I am working on focuses on the impact of speed on business and society. (that’s the first time I’ve mentioned the new book, so consider that the early preview to the tease to the coming soon). Hubspot surfaced several conclusions and recommendations as part of this research, and Suzanne Delzio did a strong summary of it over at Social Media Examiner recently. But I want to isolate a finding that strikes at the very heart of the problem companies face when trying to use social media to build their business. 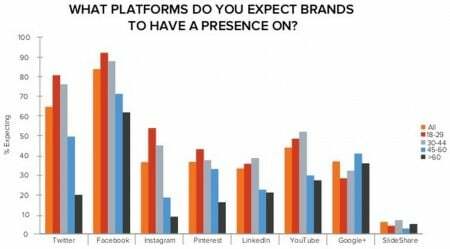 According to Hubspot, consumers expect brands to be on almost 3.5 different social platforms. More than 80% of respondents expect brands to be on Facebook, and more than 60% believe brands should be on Twitter. YouTube is a distant third at just over 40%. That all makes sense, but here comes the disconnect. 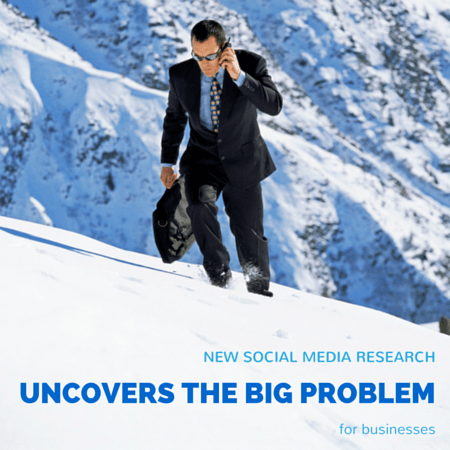 When asked by Hubspot, consumers on average follow brands on just over 1.5 social platforms. 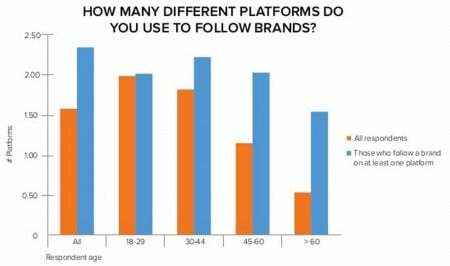 That’s not to say they follow their favorite brands on 1.5 platforms, it’s that they only use 1.5 platforms (on average) to follow any and all brands! Even more striking is the finding that approximately 35% of consumers follow no brands on any social platform. In one corner, you have companies wanting consumers to follow them on as many social platforms as possible, to be able to “engage” with them and cause them to move from like to love, to become true advocates, to buy more stuff, and other, related outcomes. In the other corner, you have consumers EXPECTING companies to be active, but not reciprocating that participation with a follow. However – and here’s where it gets particularly interesting – customers are increasingly comfortable using social to reach out to brands. 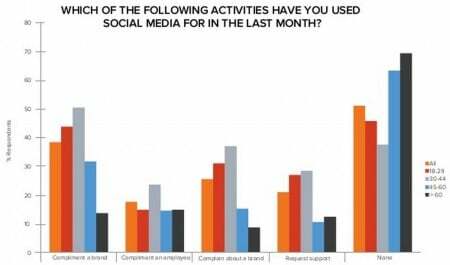 Hubspot’s research (I’m working on my own version with Edison Research and Tom Webster) nearly 50% of respondents have used social media to praise or complain about a brand IN THE PAST MONTH. 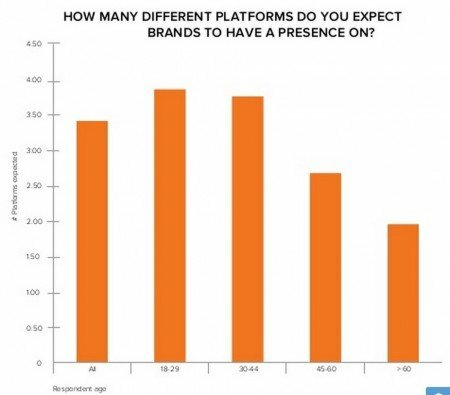 Many consumers are perfectly comfortable interacting with brands in social, and in fact they expect brands to be active in more than double the number of platforms (on average) than they follow brands upon. What we have then is a fundamental expectation gap whereby companies want (and expect) consumers to pay attention to them in social media on a routine, ongoing basis, whereas consumers prefer to give their attention to those companies on an occasional, circumstantial and staccato basis. This is the social media equivalent of the difference between buying a magazine on a news stand once in a while when you see it in the airport (as I do with Travel & Leisure, for example) versus subscribing to a periodical to make certain it shows up at your house (as I do with The Atlantic, for instance). Both are expressions of support, but the latter is much stronger and benefits the brand in a far greater way. Maybe They’re Just Not That Into You? And realistically, the consumers’ version of how social media should work for companies is probably right. As I wrote about in my popular post about Facebook giving brands a playbook for how to succeed there, social media platforms (and Facebook in particular) are trying to provide to consumers a hyper- relevant and interesting stream of massively customized information. How often does ANY brand have something to say that even ardent fans need to hear every day? This is why even though we at Convince & Convert recommend companies increase their publication frequency in social media (for algorithmic reasons), perhaps we all need to be thinking about social content effectiveness differently? Maybe we need to worry less about sustained exposure and engagement – which this research shows consumers don’t really want anyway – and worry more about crafting social content that it so useful and relevant that it breaks through consumers’ collective disinterest in branded social media? Maybe the goal shouldn’t be good engagement all the time, but great engagement from time-to-time?